Below you will find my demo reel and details of projects I've animated or directed. If you only have a few moments, the following video includes creme de la creme clips of my animated work. Sublime soundtrack composed by Rup Sidhu. I have anxiety about how quickly our surroundings change; feelings that I've projected onto the sad bird without a perch in this short film that I directed and animated in 2013. My 2011 was consumed by this lovely award winning film directed by Jill Sharpe. I was lead animator on the very subtle special effects implanted into the live action tribute to three incredible female painters. The animation served to push the film to, as Frida Khalo might call it, "beyond realism". I worked with Julia Kwan to create "Blossom". This piece was commissioned by Canada CODE to be screened at the Vancouver 2010 cultural olympiad. This is a music video I directed and animated for Stephen Hedley's fabulous song, "Scenes". The band allowed me a lot of creative freedom, and I had a great time doing the live action shoot with them! This was made possible with the aid of a VideoFact grant, 24 yards of neon green fabric, a multiplane backlit camera stand my father built for me, and the help and support of many people. Features paint on glass animation. At the end of 2010, I worked with some wonderful people at AMES to create "Tune In", a piece that will be screened in elementary school classrooms to generate discussions about bullying. I loved the experience of doing some quick Flash drawn animation for a little film with such poignant themes. Collaborating with some talented people also made this a great experience: storyboards created by Kunal Sen and sound designed by Rupinder Singh Sidhu. I love to animate to music. 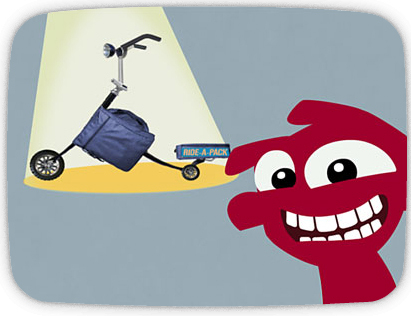 2007 yielded the most fun animation projects I've ever worked on. At Global Mechanic, I was able to do composite, create motion graphics, and animate textures and photographic elements on short educational pieces about entrepreneurialism. The charming character animation in this piece was done by Anik Rosenblum. Click here to watch "Reversal of Fortunes"
My first foray into building projection mapping was in 2011. The Dream Project at Winterfest was an event that included live DJ's and building projection mapping at the Richmond Oval. I mentored a team of talented Richmond youth to create this site specific video projection. This documentation of the projection was created by Taq Yoneda.